The first photography group of 2015 will meet on Thursday 15th January at 7:30pm, Number 8 (upstairs bar) - Suggested topic is Painting with Light: Fireworks / Traffic at night / Light Writing. Pershore Arts' member, Hazel Green, will be running a Life Drawing Session from 10:00am until 4:00pm	on Saturday 24 January 2015 at St Andrews Centre, Church Walk, Pershore. There will be a maximum of nine artists, due to the space available. The cost will be £45.00, prior booking required. Please contact Hazel for further information on Tel: 01905 613981 . Our work is still on show at the Rose & Crown pub in Severn Stoke until the end of January - this has proved to be a very successful exhibition and we extend our thanks to proprietor, Peter Fryar and his wife, Diane. As we have enjoyed such a warm welcome from Peter and Diane we have decided to have our post Christmas social there on Thursday 29th January. This will also be combined with our AGM. Saturday 28th February is the date for our planned visit to THE ASHMOLEAN MUSEUM, Oxford. Showing this month: William Blake: Apprentice and Master - a major exhibition on the work of William Blake, printmaker, painter and revolutionary poet of prophetic books. The exhibition explores how Blake looked back to the artist-printmakers of the Renaissance, and how he inspired and guided the young artist-printmakers who gathered around him in the last years of his life. There will also be 15 specially selected photographs on display in the Ashmolean Café to show how the Oxford Times has been at the forefront of documenting the history of Oxford, from the beginnings of press photography in the 19th century, to the present day. Trip by minibus / train. Book now to avoid disapointment. Telephone Frans on 01386 556927. Last week we enjoyed our post-Christmas social, and a short AGM, at the Rose & Crown at Severn Stoke. We were made very welcome by proprietor Peter Fryar and the business of the AGM was kept to a minimum! Please note: if you haven’t already paid, your subscription of £17 is due for this year - this is reduced to £30 for two members living at the same address. Our exhibition in the Dining Room at the Rose & Crown has been in place since last June. Quite a few pictures have been sold and some have been removed for show elsewhere, so now is a good time to refresh your display or to start a totally new one. If you plan to do this, please make sure you bring a label to Blu tack to the wall, providing the title and media of your piece, your name, and the price, or NOT FOR SALE if you simply wish to exhibit. Peter will deal with payments for work sold and takes 20% of the price. Please contact us if you need any more information. Now is the time to start planning ahead for work to show in our annual exhibition at Number 8. This year we have display cabinets for 3D artwork (sculpture, jewellery and other crafts) from 28th May until 8th July. Paintings, prints and photographs will be on show from 12th June until 2nd July. We would love to hear from any members who are participating in exhibitions, or other art-related activities outside those organised by Pershore Arts. We would like to promote these events to other members and anyone else who visits our website. They will also feature in our next Newsletter. Pershore Arts has been asked by Wychavon District Council to conceive and produce art projects on the theme of the First World War. If you have any ideas for an artistic commemoration of WW1 which could be part of our contribution, please contact Frans or members of the committee for details. (see contacts page). Member Kevin Pugh, a keen photographer, has already produced a number of WWII images using scale models as his source material, so he is using same approach for his WWI project. By building scale scenes, he plans to create a unique set of photographic images to display alongside the model and a ‘from start to finish’ presentation to accompany it. Do see his blog to follow the progress of this fascinating project. Our annual exhibitions at Number 8 begin next month. This year we have display cabinets for 3D artwork (sculpture, jewellery and other crafts) from 28th May until 8th July. Paintings, prints and photographs will be on show from 12th June until 2nd July. If you would like to exhibit in either or both of these exhibitions, please let us know and if possible come along to St Andrew’s Upstairs Room 7.30pm on Thursday 7th May, bringing your proposed exhibits if you are able. This will help with the planning of the exhibition and will make the hanging of work as quick and hassle-free as possible. If you can assist with the exhibition, please contact us – WE NEED YOUR HELP and it should be fun too! We have already experienced a busy start to the year. Two of our members exhibited their photographs this month: Vicky Hodgson’s “The Calling” exhibition at the Cathedral explored the representation of female Anglican priests in a series of captivating portraits. Meanwhile, Richard Phillips fascinating “Peoplescapes” took centre stage in the Gallery at Chipping Norton Theatre. Pershore Arts member Hazel Green organized and posed for life-modeling at St. Andrews’ Centre, with one-day sessions in January and March, and in April Frans Swarte ran a workshop for outdoor photography in Pershore Wetlands. To read more about all of these events and activities, please read the latest Newsletter, where you will also find details of upcoming exhibiting opportunities. In February, some of our members paid a visit to the Ashmolean Museum, Oxford. As well as a major exhibition on the work of William Blake, we enjoyed the permanent exhibitions and a special look at Tom Phillips’ work in the Print Room. It was well worth the trip and a great way to spend a grey Saturday. You may just have time to catch Kurt Jackson’s inspiring exhibition, on until 26th April at the Camden Gallery, Chipping Camden and member Dora Paynter recommends a visit to Julie Brook’s “Made, Unmade” exhibition at the Little Buckland Gallery, on until 19th April. Finally, you have until 6th June to enjoy “Stanhope Forbes’ England” at Worcester City Art Gallery & Museum. After several years’ hard work as editor of our Newsletter, Geoff Hodgson decided to step down from the role. Last year Geoff took over from Richard Phillips to lead our Photography Group, and continues to provide us with tips, challenges and inspiration, for which we are most grateful. We hope that everyone has been out and about over the last couple of months with cameras, paints and sketchbooks, making the most of the sunshine. 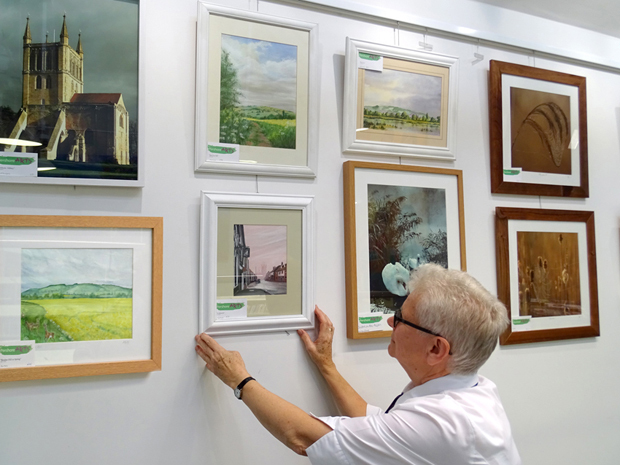 Some of our artists are preparing work for an exhibition in Pershore Abbey on August Bank Holiday Monday as part of Pershore’s hugely successful Plum Fayre. Do pop in and see them and enjoy a wander around the many attractions the Fayre has to offer. Several Pershore Arts members will be taking part in Worcestershire Open Studios, over the August Bank Holiday weekend - 29th, 30th and 31st – including printmakers Carol Stiff and Sue Farr at St. Peter’s Church, Cowleigh Bank, West Malvern. More information is available from the Worcestershire Open Studios website, including a map and details of local cafes, to help you plan a route with refreshment stops. It's a delightful way to meet other artists, see and perhaps buy some of their work, and enjoy the beautiful and varied scenery our lovely county has to offer. we have been invited to produce artwork to commemorate Wychavon’s involvement in WW1 – from the bravery and sacrifice of its troops to the hard work of those back home in food production. This will be shown at Number 8 in November. we have also been asked to contribute work to an exhibition on the theme of Pershore and its People in the Library in October. we have been allotted exhibition space in the Gallery at Evesham Arts Centre, in the weeks leading up to Christmas. We are fortunate to have this prime slot in the exhibiting calendar and hope to make the most of it. If you would like to exhibit work in any of these exhibitions, please let us know so that we can provide you with all the necessary details. Autumn has arrived and so has our next exhibition! The work of 14 members is now showing in the Library, on the theme of Pershore and Surrounds. Do pop in to have a look. In a recent survey of our members’ priorities, exhibitions came top of the list. Members who exhibited in the Abbey during the Plum Festival reported increased sales and good responses to the work on show. Taking place on the August Bank Holiday weekend, Worcestershire Open Studios attracted many visitors. Two of our members were showing linocuts at St. Peter’s Church in West Malvern and were rewarded with great interest and sold a considerable amount of work. It’s obviously a good sign if people like what you’re doing enough to buy it and it’s an encouragement to replenish your stock with new work! Our display at the Rose and Crown has been refreshed and continues to entertain pub goers and boasts a nice trickle of sales. Our next exhibition on the theme of Wychavon in WW1 will take place at Number 8 covering Armistice Day and the annual Festival of Remembrance. To close the year, we also have space at Evesham Art Centre. This open exhibition runs from October 27th until January 4th 2016. And we have signed up for the same period for 2016. Taking place in the Upstairs Bar at Number 8, the next topic is “Wildlife”, for the meeting on Thursday 15th and the theme for November is “Scapes”. Do come along, with or without photos, for a an informal and friendly chat about photography. Our exhibition on the theme of Wychavon in WW1 has received very favourable comments and is on view at Number 8 until Armistice Day. It features paintings, calligraphy, prints and photographic images from Michael Amies, Sue Batty, Mo Bogaard, Chris Dodd, Sue Farr, Hazel Green, Geoff Hodgson, Jane Hordern, Carol Stiff and Frans Swarte. The work will also be exhibited at The Civic Centre for three months from May 2016. This exhibition has now closed, but for one of our members, the work goes on – Ric Hinchliffe received a commission for a “portrait” of a Pershore resident’s house. The topic for November is “Scapes” but you can bring any work you'd like to share and/or discuss, whatever the theme. All are welcome to the meeting, which is at 7.30pm in the Upstairs Bar at Number 8 on Thursday 19th November. These gatherings are very informal and an interesting variety of visual ideas are likely to be discussed. You don't need to be an ace photographer to get some inspiration from our meetings, so do come along. Our current exhibition at Evesham Art Centre runs until January 4th 2016, prime time for Christmas purchases. We have already signed up to exhibit for the same period in 2016. This exhibition features paintings, prints and photographs. Taking place in the Upstairs Bar at Number 8, the topic is “Engineering”. Do come along, with or without photos, for an informal and friendly chat about photography.